Dr. Lin is a PETCT Fellow and Dr. Iagaru is an Assistant Professor in the Division of Nuclear Medicine, Stanford University Medical Center, Stanford, CA. Thyroid cancer is the sixth most common cancer in women in the United States and accounts for approximately 1% of all cancer cases. According to the National Cancer Institute, thyroid cancer had a prevalence of >425,000 with an incidence of 37,200 in 2009, accounting for approximately 1,600 deaths.1 Traditionally, ultrasonography and radioiodine scintigraphy have been the imaging modalities most commonly used to visualize thyroid cancer. 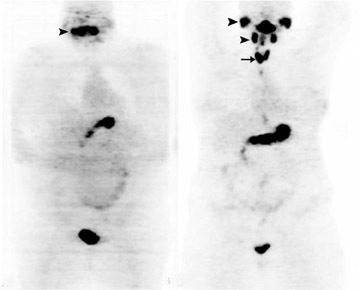 However, interest is growing in the utilization of whole-body positron emission tomography (PET) with computed tomography (CT) to image thyroid malignancy. Currently, whole-body PET-CT is approved for use in assessing suspected recurrence of well-differentiated thyroid cancer (WDTC) in patients with radioiodine-negative scans and detectable thyroglobulin (Tg) levels. While PET-CT has proved itself in this clinical scenario, evidence is emerging on the advantages of PET-CT imaging in other histological types of thyroid malignancy, such as Hürthle cell, medullary, and the anaplastic variants. Moreover, although current clinical PET-CT scans are performed almost exclusively with 2-deoxy-2-(18F) fluoro-D-glucose (FDG), recent advances in targeted molecular imaging are bringing new possibilities to the imaging of thyroid cancer. The development of human recombinant thyroid stimulating hormone (rhTSH), for example, is making imaging under thyroid hormonal stimulation more feasible, and novel PET radiotracers such as Iodine-124 (124I), 18F-DOPA, and 68Ga-DOTATOC promise to change the way thyroid malignancies are imaged. Based on histology, thyroid cancer can be broadly divided into well-differentiated follicular and papillary, medullary, and anaplastic variants. This classification is important because the histological type impacts prognosis, treatment, and evaluation with imaging. In a typical clinical scenario, the patient with well-differentiated thyroid cancer undergoes total thyroidectomy, followed in most cases by radioiodine ablation of the thyroid remnant.3 A follow-up whole-body radioiodine scan is performed every 6 months to 12 months. Since thyroid cancer cells have a lower expression of sodium-iodine symporters, and therefore have a decreased ability to concentrate iodine compared with normal thyroid tissue,4 better diagnostic accuracy is obtained from the radioiodine scan when the patient is administered thyroid-stimulating hormone (TSH). Stimulation can be achieved intrinsically via withdrawal of the patient’s thyroid hormone replacement medications, or it can be done extrinsically by administration of rhTSH. In addition to the radioiodine scan, standard practice follow-up also usually involves obtaining serum Tg levels and a neck ultrasound scan.3 Thyroglobulin is a dimeric protein found exclusively within the thyroid gland unless thyroid pathology such as thyroiditis or malignancy is present. Its detection in the serum in a post-thyroidectomy patient indicates the existence of residual thyroid cancer cells. Hürthle cell variants of WDTC deserve special attention because they, as a group, have low iodineconcentration functions and are more likely to be falsely negative on a radioiodine scan.14 Suspicion for recurrence should be especially high, and further imaging with PET-CT warranted, in a Hürthle cell patient with elevated serum thyroglobulin levels despite a negative radioiodine scan. >WDTC retains the ability to concentrate iodine, but at a much lower level compared with normal thyroid tissue. Stimulating thyroid cancer cells with TSH increases their radioiodine uptake, thereby improving scan sensitivity. Recombinant human TSH has been used successfully as an alternative to traditional hormone withdrawal in preparing patients for a radioiodine scan, and numerous studies have documented equivalent imaging results with rhTSH.15–19 However, it is less clear whether stimulation with intrinsic TSH or rhTSH improves the sensitivity of FDG PETCT in thyroid cancer. While some early papers suggest improved detection rates with rhTSH stimulation,20–21 more recent studies are more equivocal.22 For instance, a 2009 study found that PETCT scans performed before and 24 hours to 48 hours after administration of rhTSH demonstrated per lesion sensitivities of 81% and 95%, respectively, with a p value of 0.001.23 However, when the data were analyzed on a per-patient basis, the sensitivity between the 2 groups became equivalent (54% vs. 49%) and resulted in management changes in only 6% of patients. Another study, published in 2010, placed the sensitivity of rhTSH-stimulated PET-CTs at only 41%.24 Although it is logical to accept that rhTSH can be used to improve the sensitivity of FDG PET-CT for thyroid malignancy, more data are needed to determine the true usefulness of rhTSH in this indication. Of the malignant lesions, the vast majority (82.2%) were papillary thyroid cancer. Remaining malignancies included: follicular thyroid cancer (1.9%), Hürthle cell cancer (2.8%), medullary thyroid cancer (1.9%), lymphoma (2.8%), and metastatic disease (6.5%). One study suggests that primary thyroid cancers detectable by FDG-PET tend to have more aggressive histological features and denote a poorer prognosis,33 although more data are needed to confirm this finding. Medullary thyroid cancer (MTC), which is rare, affects the parafollicular C cells of the thyroid gland and cannot be imaged effectively with radioiodine. Currently, FDG PET-CT in medullary thyroid cancer is most commonly used in cases where conventional imaging modalities are negative or inconclusive in the presence of elevating tumor markers such as calcitonin and carcino-embryonic antigen (CEA).40 Some studies show that FDG PET-CT is superior to conventional modalities, such as ultrasound, contrast-enhanced CT, and 111In octreotide scans in the detection of recurrent MTC.41-42 However, the diagnostic accuracy of FDG PET-CT for MTC is limited compared with its use in WDTC. Overall sensitivity has been reported to range from 47.4%43 to 80%;44 however, detection rates seem to improve in patients with higher serum calcitonin levels. Some novel, experimental PET-CT radiotracers seem to show promise in the imaging of MTC. For instance, PET-CT performed with 18F-dihydroxyphenylalanine (18F DOPA) was shown in a European trial to have a sensitivity of 94% vs. 62% for FDG.45 A number of 68Ga-DOTA peptides that bind to somatostatin receptors, such as DOTA-TOC and DOTA-NOC, are also being evaluated for this indication.46 However, more experimental data are needed before these new radiotracers will see clinical use in the United States. Anaplastic thyroid cancer is an undifferentiated carcinoma that arises from thyroid follicular cells. It is very aggressive and portends a poor prognosis; it is capable of doubling its volume in 7 days.47 Due to its aggressive growth and subsequent significantly elevated glucose utilization, several case reports have shown FDG PET-CT’s ability to detect both primary and metastatic anaplastic thyroid cancer.48–51 A 2007 study found that PET-CT imaging with FDG detected all primary tumor and nodal metastases, as well as 5 out of 8 lung metastases.46 However, better characterization of FDG PET-CT’s diagnostic accuracy and more studies are needed. Although conventional modalities such as ultrasonography and radioiodine whole-body imaging are still important, FDG PET-CT is playing an increasingly important role in the evaluation of thyroid cancer. In addition to strong data already showing the utility of PET-CT imaging with FDG, the advent of novel PET radiotracers such as 18F DOPA and 68Ga-somatostatin receptor binders may one day revolutionize imaging of medullary and anaplastic thyroid cancers. Altekruse SF, Kosary CL, Krapcho M, et al. SEER Cancer Statistics Review, 19752007, National Cancer Institute, Bethesda, MD. Available at: http://seer.cancer.gov/csr/1975_2007. Accessed on November 14, 2010. Sharma PK, Johns MM III. Thyroid cancer. EMedicine from WebMD. 2010. Available at: http://emedicine.medscape.com/article/851968overview. Accessed on November 14, 2010. The American Thyroid Association Guidelines Taskforce. Management guidelines for patients with thyroid nodules and differentiated thyroid cancer. Thyroid. 2006;2:109-142. Dai G, Levy O, Carrasco N. Cloning and characterization of the thyroid iodide transporter. Nature. 1996;379:458-460. Iagaru A, Masamed R, Singer PA, Conti PS. 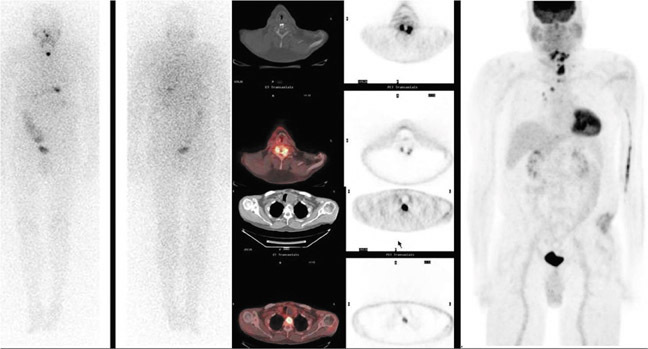 2Deoxy2[18F]fluoroDglucosepositron emission tomography and positron emission tomography/computed tomography diagnosis of patients with recurrent papillary thyroid cancer. Mol Imaging and Biol. 2006;8:309–314. Kim SJ, Lee TH, Kim IJ, Kim YK. Clinical implication of F18 FDG PETCT for differentiated thyroid cancer in patients with negative diagnostic iodine123 scan and elevated thyroglobulin. Eur. J Radiol. 2009; 70:1724. Roberts M, Maghami E, Kandeel F, et al. The role of positron emission tomography scanning in patients with radioactive iodine scannegative, recurrent differentiated thyroid cancer.Am Surg. 2007;73: 1052–1056. Palmedo H, Wolff M. PET and PET/CT in thyroid cancer. Recent Results Cancer Res. 2008;170:5970. Finkelstein SE, Grigsby PW, Siegel BA, et al. Combined [18F]Fluorodeoxyglucose positron emission tomography and computed tomography (FDGPETCT) for detection of recurrent, 131Inegative thyroid cancer. Ann Surg Oncol. 2008;15:286–292. Shammas A, Degirmenci B, Mountz JM, et al. 18FFDG PETCT in patients with suspected recurrent or metastatic welldifferentiated thyroid cancer. J Nucl Med. 2007;48:221–226. Dong MJ, Liu ZF, Zhao K, et al. Value of 18FFDGPET/PETCT in differentiated thyroid carcinoma with radioiodinenegative wholebody scan: A metaanalysis. Nucl Med Commun. 2009;30:639–650. Bertagna F, Bosio G, Biasiotto G, et al. 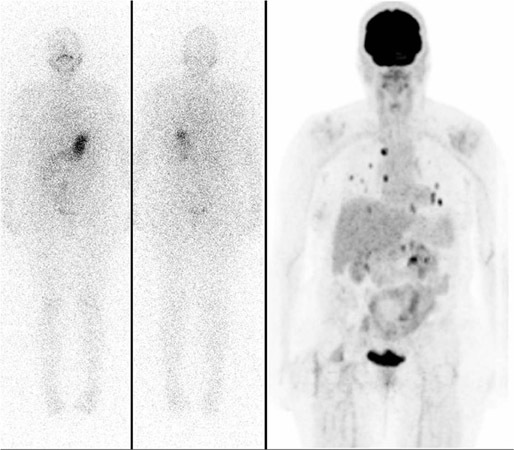 F18 FDGPETCT evaluation of patients with differentiated thyroid cancer with negative I131 total body scan and high thyroglobulin level.Clin Nucl Med. 2009;34:756–761. Dietlein M, Scheidhauer K, Voth E, et al. Fluorine18 fluorodeoxyglucose positron emission tomography and iodine131 wholebody scintigraphy in the followup of differentiated thyroid cancer. Eur J Nucl Med. 1997;24:1342–1348. Lowe VJ, Mullan BP, Hay ID, et al. 18FFDG PET of patients with Hürthle cell carcinoma. J Nucl Med. 2003;44:1402–1406. Ladenson PW, Braverman LE, Mazzaferri EL, et al. Comparison of administration of recombinant human thyrotropin with withdrawal of thyroid hormone for radioactive iodine scanning in patients with thyroid carcinoma. N Engl J Med. 1997;337: 888–896. Haugen BR, Pacini F, Reiners C, et al. A comparison of recombinant human thyrotropin and thyroid hormone withdrawal for the detection of thyroid remnant or cancer. J Clin Endocrinol Metab.1999;84: 3877–3885. Mariani G, Ferdeghini M, Augeri C, et al. Clinical experience with recombinant human thyrotrophin (rhTSH) in the management of patients with differentiated thyroid cancer. Cancer Bio ther Radiopharm. 2000;15:211–217. Robbins RJ, Tuttle RM, Sharaf RN, et al. Preparation by recombinant human thyrotropin or thyroid hormone withdrawal are comparable for the detection of residual differentiated thyroid carcinoma. J Clin Endocrinol Metab. 2001;86:619–625. Niederkohr RD, McDougall IR. Reproducibility of wholebody 131I scan and serum thyrotropin and stimulated thyroglobulin values in patients studied twice after injection of recombinant human thyrotropin. Eur J Nucl Med. and Molecular Imaging. 2007;34:363–367. Chin BB, Patel P, Cohade C, et al. Recombinant human thyrotropin stimulation of fluoroDglucose positron emission tomography uptake in welldifferentiated thyroid carcinoma. J Clin Endocrinol Metab. 2004;89:91–95. Petrich T, Börner AR, Otto D, et al. Influence of rhTSH on [(18)F]fluorodeoxyglucose uptake by differentiated thyroid carcinoma. Eur J Nucl Med. Mol Imaging. 2002;29:641–647. Iagaru A, Kalinyak JE, McDougall IR. F18 FDG PETCT in the management of thyroid cancer. Clin Nucl Med. 2007;32:690–695. Leboulleux S, Schroeder PR, Busaidy NL, et al. Assessment of the incremental value of recombinant thyrotropin stimulation before 2[18F]Fluoro2deoxyDglucose positron emission tomography/computed tomography imaging to localize residual differentiated thyroid cancer. J Clin Endocrinol Metab. 2009;94:1310–1316. Vera P, KuhnLansoy C, EdetSanson A, et al. Does recombinant human thyrotropinstimulated positron emission tomography with [18F]fluoro2deoxyDglucose improve detection of recurrence of welldifferentiated thyroid carcinoma in patients with low serum thyroglobulin? Thyroid. 2010;20:15–23. Chen W, Parsons M, Torigian DA, et al. Evaluation of thyroid FDG uptake incidentally identified on FDGPETCT imaging. Nucl Med Commun. 2009;30:240–244. Eloy JA, Brett EM, Fatterpekar GM, et al. The significance and management of incidental [18F]fluorodeoxyglucosepositronemission tomography uptake in the thyroid gland in patients with cancer. AJNR Am J Neuroradiol. 2009;30:1431–1434. Bae JS, Chae BJ, Park WC, et al. Incidental thyroid lesions detected by FDGPETCT: prevalence and risk of thyroid cancer. World J Surg Oncol.. 2009;7:63. Ohba K, Nishizawa S, Matsushita A, et al. High incidence of thyroid cancer in focal thyroid incidentaloma detected by 18Ffluorodexyglucose positron emission tomography in relatively young healthy subjects: results of 3year followup. Endocr J. 2010;57:395-401. Kwak JY, Kim EK, Yun M, et al. Thyroid incidentalomas identified by 18FFDG PET: sonographic correlation. AJR Am J Roentgenol. 2008;191: 598–603. King DL, Stack BC, Spring PM, et al. Incidence of thyroid carcinoma in fluorodeoxyglucose positron emission tomographypositive thyroid incidentalomas. Otol Head Neck Surg. 2007;137:400–404. Are C, Hsu JF, Schoder H, et al. FDGPET detected thyroid incidentalomas: Need for further investigation? Ann Surg Oncol.2007;14:239–247. Shie P, Cardarelli R, Sprawls K, et al. Systematic review: prevalence of malignant incidental thyroid nodules identified on fluorine18 fluorodeoxyglucose positron emission tomography. Nucl Med Commun. 2009;30:742–748. Are C, Hsu JF, Ghossein A, et al. Histological aggressiveness of fluorodeoxyglucose positronemission tomogram (FDGPET)detected incidental thyroid carcinomas. Ann Surg Oncol. 2007;14: 3210–3215. Bogsrud TV, Karantanis D, Nathan MA, et al. The value of quantifying 18FFDG uptake in thyroid nodules found incidentally on wholebody PETCT. Nucl Med Commun. 2007;28:373–381. McMenemin RM, Hilditch TE, Dempsey MF, Reed NS. Thyroid stunning after (131)I diagnostic wholebody scanning. J Nucl Med. 2001;42:986–987. Phan HT, Jager PL, Paans AM, et al. The diagnostic value of 124IPET in patients with differentiated thyroid cancer. Eur J Nucl Med. and Molecular Imaging. 2008;35:958–965. Freudenberg LS, Antoch G, Frilling A, et al. Combined metabolic and morphologic imaging in thyroid carcinoma patients with elevated serum thyroglobulin and negative cervical ultrasonography: Role of 124IPETCT and FDGPET. Eur J Nucl Med. and Mol. Imaging. 2008;35:950–957. Lubberink M, Abdul Fatah S, Brans B, et al. The role of (124)IPET in diagnosis and treatment of thyroid carcinoma. Q J Nucl Med Mol Imaging. 2008;52: 30–36. Capoccetti F, Criscuoli B, Rossi G, et al. The effectiveness of 124I PETCT in patients with differentiated thyroid cancer. Q J Nucl Med Mol Imaging. 2009;53:536–545. Nanni C, Rubello D, Fanti S, et al. Role of 18FFDGPET and PETCT imaging in thyroid cancer. Biomed Pharmacother. 2006;60:409–413. Rubello D, Rampin L, Nanni C, et al. The role of 18FFDG PETCT in detecting metastatic deposits of recurrent medullary thyroid carcinoma: A prospective study. Eur J Surg Onco. 2008;34:581–586. Iagaru A, Masamed R, Singer PA, Conti PS. Detection of occult medullary thyroid cancer recurrence with 2deoxy2[F18]fluoroDglucosePET and PETCT. Mol Imaging Biol. 2007;9:72–77. Skoura E, Rondogianni P, Alevizaki M, et al. Role of [(18)F]FDGPETCT in the detection of occult recurrent medullary thyroid cancer. Nucl Med Commun. 2010;31:567–575. Bockisch A, BrandtMainz K, Görges R, et al. Diagnosis in medullary thyroid cancer with [18F]FDGPET and improvement using a combined PETCT scanner. Acta Med Austriaca. 2003;30:22–25. Beheshti M, Pöcher S, Vali R, et al. The value of 18FDOPA PETCT in patients with medullary thyroid carcinoma: comparison with 18FFDG PETCT. Eur. Radiol. 2009;19:1425–1434. Ambrosini V, Marzola MC, Rubello D, Fanti S. (68)Gasomatostatin analogues PET and (18)FDOPA PET in medullary thyroid carcinoma. Eur J Nucl Med. Mol Imaging. 2010;37:46–48. Bogsrud TV, Karantanis D, Nathan MA, et al. 18FFDG PET in the management of patients with anaplastic thyroid carcinoma. Thyroid. 2008;18: 713–719. Jadvar H, Fischman AJ. Evaluation of Rare Tumors with [F18]Fluorodeoxyglucose Positron Emission Tomography. Clin Positron Imaging. 1999; 2:153–158. Poppe K, Lahoutte T, Everaert H, et al. The utility of multimodality imaging in anaplastic thyroid carcinoma. Thyroid. 2004;14:981–982. Nguyen BD, Ram PC. PETCT staging and posttherapeutic monitoring of anaplastic thyroid carcinoma. Clin Nucl Med.2007;32:145–149. Iagaru A, McDougall IR. F18 FDG PETCT demonstration of an adrenal metastasis in a patient with anaplastic thyroid cancer. Clin Nucl Med.2007; 32:1315. Updates on PET-CT and thyroid cancer. Appl Radiol.